Spain is quite a different country today than the one I frequented as a young teenager with my family. Franco’s final decade saw the country’s economy spiraling steadily downward until his death in 1975, when Spain was declared to be in a state of crisis. While revered by sun-starved Brits for its warm climate, Spain was then perceived almost as a third-world country, good mostly for cheap wine, tan lines and perhaps even the odd fling—certainly not a place where one would actually want to live. 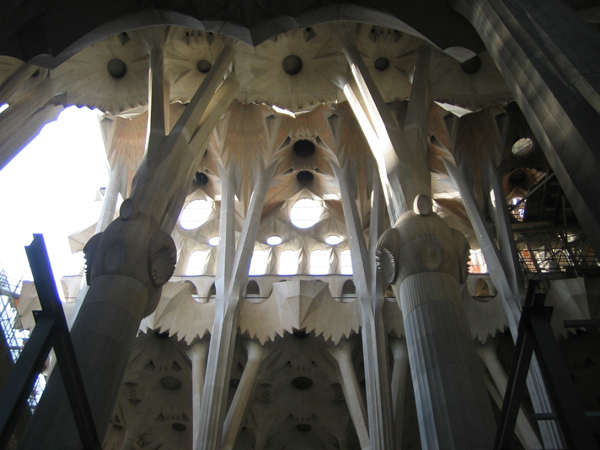 Everyone knows of Antoni Gaudi, but as a die-hard modernist and part-time post-modernist, I always found his celebrated work rather over the top. Yet the first glimpse of the Sagrada Familia between buildings from atop of a moving bus almost stopped my heart. The moment forced the question: what gives great architecture its impact? Is it simply its creative might, or is it in small part the way one happens upon it? (I made a quick resolve to view our own Cesar Pelli building from a fresh perspective upon returning home.) Gaudi’s work is unique not only to Spain—it stands out as outrageously there as it would anywhere—but his work is testimony to the fact that a city adapts to its architecture and in some strange way embraces it as its own. If Barcelona claims Picasso as her artist, it is easy to see why Gaudi is her architect. 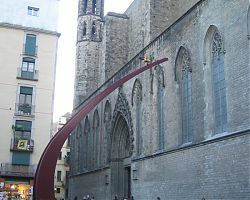 His work claims hidden corners of the great city as well as parks and residences, churches, palaces, gardens and gates. Reminiscent of something out of a sci-fi movie, the sheer verticality of Sagrada Familia was unprecedented due to Gaudi’s daring idea to simplify the structural idea of Gothic architecture. 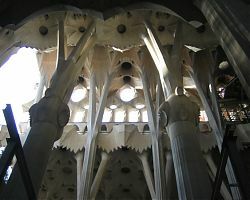 Using tiered interior galleries instead of lateral buttresses made his innovation possible, and one of the greatest cathedrals of the world was conceived. 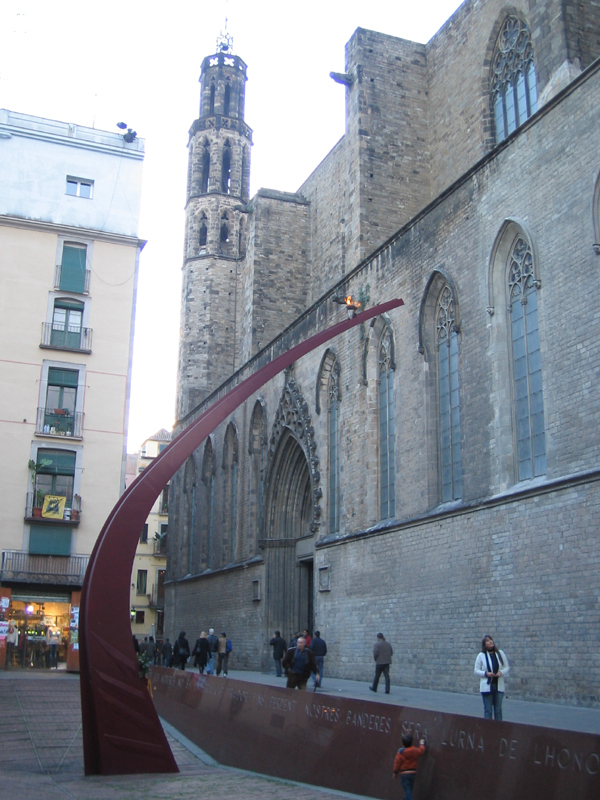 Long before lateral or flying buttresses, there was Barcelona’s oldest place of worship, the Gothic church La Iglesia de Santa Maria del Mar. It is ensconced comfortably and, it seems, eternally in El Borne, the city’s founding site and subsequent Gothic settlement. El Borne is the sort of place that we long for in Charlotte. It is a revived bohemian area settled by a younger crowd, a place of labyrinths and alleys with boutiques and cafes at every turn. Average food is not on the menu, foreign languages fly by and the light casting shadows on ancient stone buildings heightens the aura of authentic, honest culture. La Iglesia is a repository for religious practice that has existed for thousands of years, its unprecedented high ceilings and hushed atmosphere still inspiring devotion and servitude. For the rest of us, the experience of the space itself is a sobering and powerful one. A 4.5 hour drive east lands one in the struggling-to-keep-up city of Bilbao. 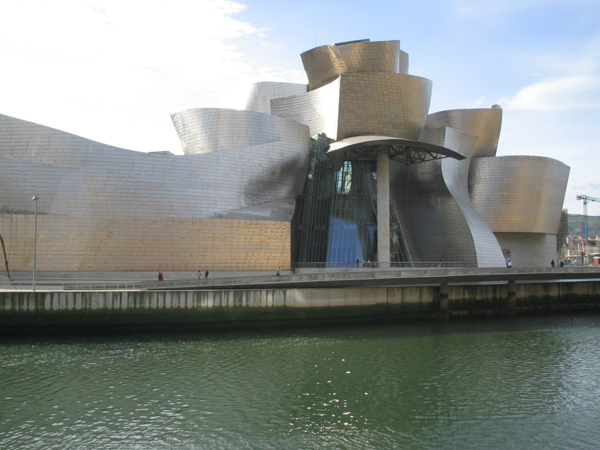 If Bilbao isn’t quite sure what happened to it, Frank Gehry is absolutely certain. While his “fish” at the Barcelona Marina is jocular and light-hearted, the Guggenheim is as serious as an alien landing on earth—while we can’t escape the fantasy of it, the implications are huge. A more recent trip to Chicago left the memory of Frank Lloyd Wright’s authoritative voice and his contention that “…the future of mankind lays in its architecture.” Almost a century later, Gehry may not have guaranteed the future of mankind, but his spacecraft-like building has certainly transported architecture into the future. 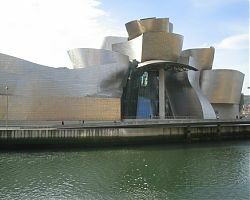 Gehry’s controversial museum covers the needs of art most adequately. There are special recesses for site-specific pieces (how else could you fit three 25 foot red Jim Dine Venus de Milo sculptures in one place? ), which are flanked by huge rectangular galleries housing spectacular exhibitions from abstract expressionism to a one person installation, and spaces where art and architecture wind sinuously around one another. Well-planned exterior spaces accommodate experimental steam and water sculptures, and the interior’s powerful, flowing materials add weight to an already visceral and spiritual experience. It was irresistible to fantasize about Charlotte’s Bechtler Museum, by Swiss architect Mario Botta, which is scheduled to open in 2009. While smaller than the Guggenheim, it is nonetheless a coup masterminded by collector and art patron Andreas Bechtler, who rallied enough local chutzpah to actually bring this to the table. Botta’s edifice promises a new dawn for Charlotte art and architecture. Specifically known for respecting regional sensibilities and topographical conditions, Mario Botta has designed for Charlotte his second U.S. art museum, the first being the acclaimed San Francisco Museum of Modern Art, built in the eighties. We are in very good company indeed. 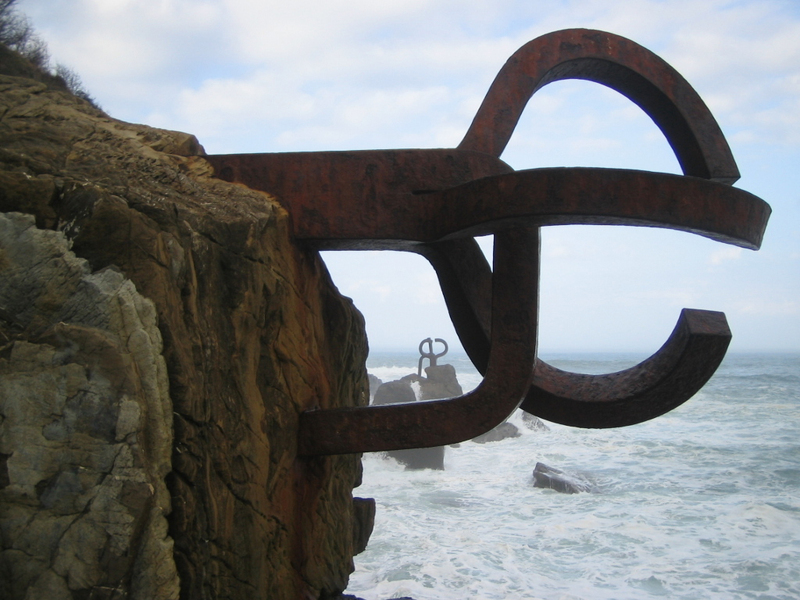 An hour back west is the small town of San Sebastian, home of world-renowned sculptor Eduardo Chillida. Chillida could be characterized as an architect and engineer who made sculptures and objects, but he was also a poet and philosopher. He described his life as one of “asking, doubting, searching”—and if the result of that is his life’s work, then the blindly unquestioning segment of our society has cause to be concerned. Bolted into the cliffs at the end of the San Sebastian promenade, where foaming white breakers crash upon them each minute, Chillida’s steel sculptures are a gift to the city. Gazing upon them, my thoughts eventually drifted back home, as I considered how proud we should feel that Charlotte, with its new Lynx stations and numerous other public art initiatives, supports several truly great local sculptors. Obviously, the new Spain has come further than the new South, but to be fair, it did have a head start. However our art scene is growing, new “think” groups are popping up, we now have a couple of international architects under our belt and soon we will have another important museum on the skyline. Each one of us is a component in our city’s growth and perhaps that’s why we’re here. To build it. A fantastic essay, Joie! It is amazing and encouraging that, despite our love of all things sports, we’re building a strong cultural scene in Charlotte thanks in large part to pioneers like you. This essay is wonderfully inspiring. Thank you, Joie! Wow! For Chillida on the coast. I’d never heard of or seen this work before. Now I’ll have to search it out. Yay, a peek at the world beyond Charlotte. Brava! You’ve inspired me! These cities are on my list. Looking forward to seeing your own gallery, too, Joie. It’ll be a treat to see how the years unfold for you. Your thoughts are right on target! Joie, thanks for sharing your inspiring views.